When you come into church and there is a service taking place how do you feel and how do you react? Perhaps you feel at ease and reverent, recognising the words and actions of worship. You may feel drawn into prayer simply being present within the same building. If the service is a wedding, you may feel excluded, not being a part of the family or an invited guest. You could though easily slip into the side chapel and pray or simply sit quietly. 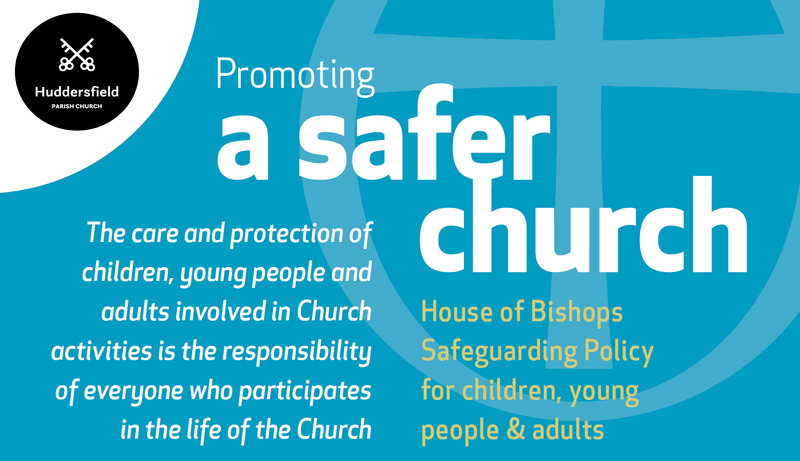 But, if the worship is beyond your experience, you could feel completely ill at ease, perhaps as far from God as you could be, on edge and unable to focus Huddersfield Parish Church welcomes back the Christian Ethiopian Orthodox Church between 7th and 23rd August. As part of their ancient worship this group of dispersed Christians observe a festival of Mary. The will be giving thanks for Jesus birth and raising, they worship night and day for sixteen days. The worships begins around one o’clock with a Eucharist, which is three of four hours in length. Set liturgies take place as the day progresses and at all times someone remains awake in prayer. The evenings are set aside for bible study and teaching? A daily routine fast is observed by most of the worshippers and broken each evening with national Ethiopian dishes, although a complete fast from the consumption of meat is observed until the final ‘Feast Day’ . Some people make their way home to sleep at various parts of the cycle of worship, whilst a number who may come from other parts of the UK use the long room and gallery up stairs in St. Peter’s to catch an odd hour or twos sleep. The words of the liturgy are unusual to our ear. Ethiopian is an ancient language and has a similar cadence and meter to Arabic. The worshippers cover their head and use their bodies to honour God the Trinity. There is also high regard for the worship space in the Orthodox tradition. This is seen in the removing of shoes within the church, this is an Old Testament tradition, going as far back as Moses removing his shoe as he met God at the burning bush because of that place being “Holy Ground”. The Lady Chapel in Huddersfield Parish Church will also be curtained off. Most Orthodox tradition reflect the Jewish temple theology of the “Holies of Holies” which is reserved for the priests and the action and beauty of the mass. So when you enter St. Peter’s during the residency of the Ethiopian Orthodox Church take a moment to see through the tradition, the sound, words and actions. We are welcoming a group of people who trace their Christian roots back to the evangelisation by St. Philip. It’s origins are based in the early church and the foundations and style of worship found in the Middle East and Israel. Recognised the prayerfulness and worship. The setting aside of time, a great expanse of God in Christ. You are welcome to observe and add your prayers to the gathered congregation in this Holy observance . 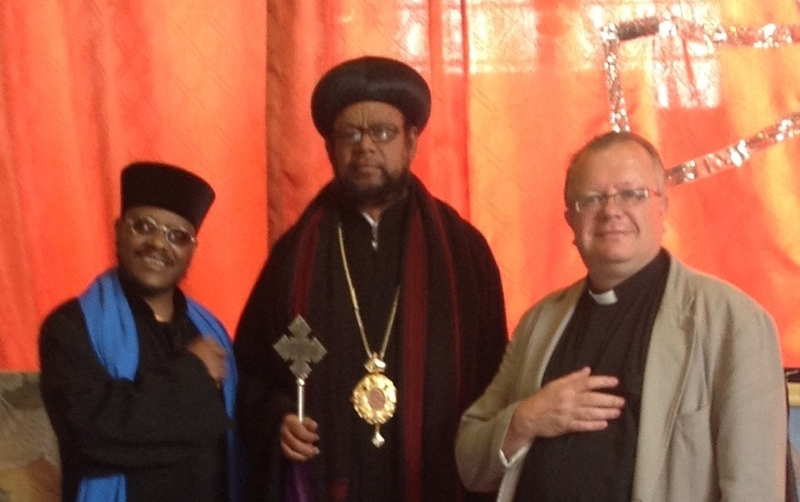 Archbishop Antonio (centre)the leader for the North-Western European Diocese of the Ethiopian Orthodox Church. Coming out of silence at Mirfield, I made an excursion to Huddersfield to pay my respects to Harold Wilson. Entering St Peter’s I was delighted to find two treasures, the presence of Ethiopian Christians with whom I conversed with and the Ninian Comper Baldachino & stained glass.